Being beautiful is not only about what is on the outside, but what is in the inside as well. How a person handles their health and treats their body on the inside will be reflected on the exterior. Taking care of your body by maintaining a healthy lifestyle, will assure that you are able to live a long and healthy life. On Tuesday, February 23, the beauty symposium was held in the student center atrium to discuss the topics of health, beauty and fitness. The panel of guest speakers consisted of professional women that specialize in maintaining a healthy lifestyle. The three women were dermatologist Dr. Pamela Royal, physical therapist and author “Love Affair with my Hair: Why Black Women Cheat on Health” Dr. Desiree Williams, and expert hairstylist Patrice Hector. The panel of elite women stressed the importance of living a healthy lifestyle that will benefit young Black women for years to come. Along with these tips, advice about hair, working out and eating right where also given to audience members as they listened and asked questions to the knowledgeable panelists. “The women featured at the panel discussion gave very helpful tips for people wanting to be able to be healthy on the inside and out,” sophomore, Ayo Sutherland from Pasadena, California, stated. It is important for college-aged ladies to ensure they are eating nutritious food and maintaining a balanced diet. “The panelists were able to address the most commonly asked questions and concerns on how to stay happy and healthy as you progress through your life,” Serena Rudisel said. Rudisel, a junior, electrical engineering major from Long Island, New York, attended the event to get a better understanding of what lifestyle changes can help improve her health. “The biggest lesson I got from the panel was that a healthy life journey starts out in your teenage and, even, adolescent years, and it should be an ongoing journey,” Rudisel continued. 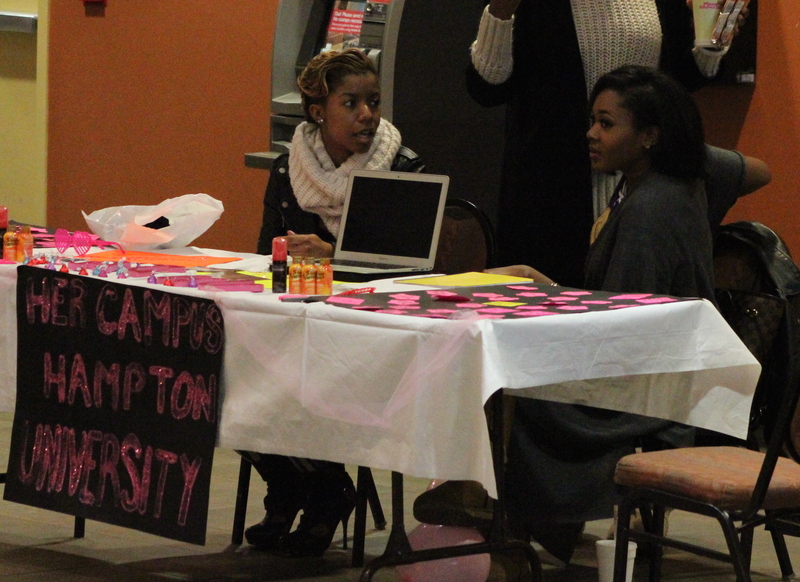 The Beauty Bash also included tables for vendors including Her Campus an online student-run magazine for Hampton University. Other vendors showcased their products including Hampton University sophomore Gabby Snipes. Snipe, a kinesiology major, featured her clothing line InnerG. An addition to clothing, Ashley Mendez, founder of the make-up company Throne Cosmetics, featured her natural lipstick line to attend to the seminar. The Beauty Bash helped students learn about improving their lifestyles. It will be the first step of many to educate Hampton University’s campus on becoming healthier.